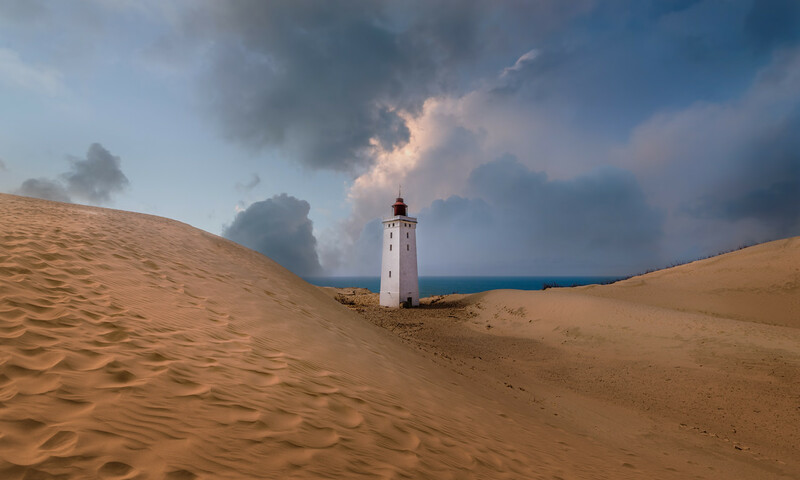 Rubjergknude Light house stands in the middle of a moving sand dune. The surrounding houses lies as debris around the light house. It is predicted, that it will fall into the sea in 10-15 years. This Weekend Post is about, how I prepared this image for a huge print. When you have to prepare a large print, you must be more careful, than with a smaller print. Even small irregularities and dust spots will be easy to see and can potentially ruin the whole print. And a larger print is more expensive. So time spent preparing your photo, is time well spent. Recently I had to prepare a 130cm / 52 inches wide print for an exhibition at Photographers Lab in Copenhagen, and some problems showed themselves. Some of you might remember this image from a fairly recent post (a post about why this composition is so strong). I showed how the initially processed photo was a bit too flat, and how a textured version had too strong texture, but the right mix was just perfect. 200% crop of the processed photo. This texture will not look good in a huge print. While this kind of texture and grittiness does look fine in the small version of the image, I am pretty sure, it will not work in a huge print. And I will certainly not do an experiment because that is expensive. The hairs and scratches come from one of the textures I used, and it is only 6 megapixels. Six megapixel is ok when you mix a lot, and the textures don’t stand out individually. In this case, the texture with hairs and scratches stands out, and that is not good. I removed the textures. Then I switched them on and off for a bit until I suddenly realized what it is the textures do for this photo. They add colors and toning, the texture as a texture is secondary. Sometimes I want the grittiness the textures can give, but at other times, it is the colors and toning I want. In this case, it is the colors and the toning, and not the textures. At this zoom level, you hardly notice the textures, but the colors and the light are different, and that is what is important. I now had a problem I had to solve: How to add light and colors similar to what the textures add? I started by adding a Hue and Saturation adjustment layer and, switched on the colorize check mark. Now the whole image turns into one hue, just in different tones, like a mono chrome. You can use Colorize to change the color of an image, and if you mask in or out, you can target specific areas. I found an orange brown’ish color similar to that color the textures had added to the sand. What I had to do now, was to mix this colored layer in using the mask. I painted in, in various degrees over the sand. The stronger I painted in, the warmer and the darker it became. I could use this layer to dodge and burn, as well as changing the colors. It quickly began to look like the textured image. However, I couldn’t achieve everything I wanted, from the orange layer. I couldn’t use it, in the clouds for instance. Instead, I created a number of adjustment layers to enhance light, contrast, colors etc. There are a number of basic steps you have to go through when you print. One of the most important things is to clean up your scene. This photo has a peaceful mood, and I want to keep it that way, as much as possible. When this gets blown up big, small rubble and stones in the sand stick out. I cloned out that all over the big soft dune. The Light House is standing in the middle of a moving sand dune, and the surrounding houses have been crushed by the dune and torn down. There’s a lot of debris from that in the sand, and that is a part of the scene, even if a lot less peaceful. I removed a few that caught my eye, from the principle, if it catches my eye, it will probably also catch the eye of somebody else. I also went through the sky, found a couple of dust spots and a bird. Those I removed too. And I removed a cord going on the outside of the light house. The sky has some noise. I use Topaz Denoise to remove it. I am careful not to lose details in the sand and the light house. When you print, you want to sharpen the image more, just be careful not to get sharpening halos, they will be easy to spot on a large print. Removing sharpening halos can be done, but is a big hastle. It’s better to avoid them. I sharpened the Light house and the vegetation on the right hand side dune. Sometimes I also brighten my photos slightly. A monitor has light, and you can see it in the dark. A print doesn’t light up, it has to have the brightness built into the image. If you are unsure, see if you can get a small print proof before you print for real. This can save some frustration. When you have done it a few times, you get to know your printing company, and what happens. In the case of this photo, I did not brighten additionally. But I would say I do it in 50% of the cases. Below here, you can see the difference between the textured and the print ready image. Not exactly the same, but in many ways, the same feeling is present. If you find my articles interesting and consider getting AuroraHDR, please use the link on my webpage and support me that way. I only recommend software and tools that I use. I am not ‘bought’ to say nice things with sugar on top. I say what I think and feel about products. I get nothing for writing these articles, but I do get a kickback if you use my link to buy AuroraHDR , as well as if you use my 15% discount coupon code “caughtinpixels” for buying Buy Photomatix Pro. Thanks. If you like my work, why not follow me on Twitter, Facebook, and Google+. I post photos daily. I print commercially. I use http://www.grafikogfoto.dk. The quality is the best I have seen in Denmark.